If you’ve been following this blog for a while, you will know that OCN is a channel as crime and mystery thrillers are what I call my “fall back genre” or the genre that I like to watch when I can’t decide on what to watch next. Aside from this, I have a big soft spot for anything that has to do with heists and con men, so I decided to pick this up as I have seen Krystal Jung in another drama this year, and because I hoped that this Song Seung Hong led drama wouldn’t disappoint me as much as “Black’s” ending did. The result was a fun drama that went big on the bromance and camaraderie, with good acting from the entire cast, but had glaring pacing and narrative issues with heists that weren’t really executed smoothly. However, it was a fun watch, and I love the camaraderie that our little ragtag team had with each other. “Player” aired on OCN for fourteen episodes every Saturday and Sunday from September 29 to November 11, 2018. It was directed by Go Jae Hyun and written by Shin Jae Hyung. The drama follows a ragtag crew of swindlers who are experts in their field and only go after the rich and powerful. 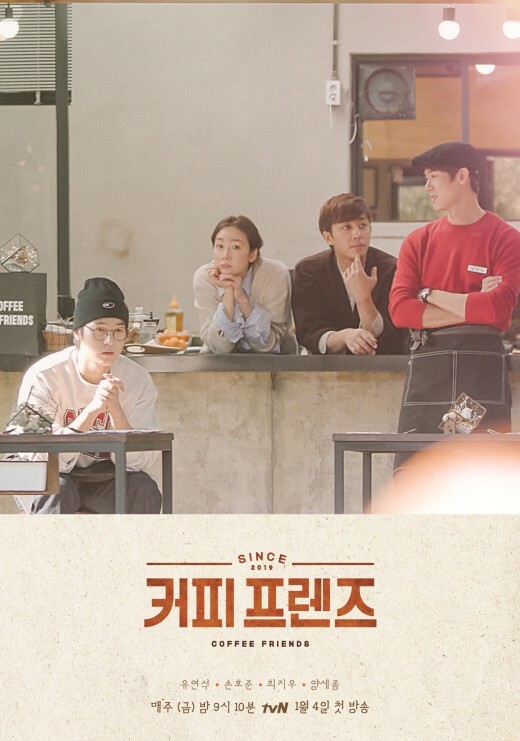 The team is composed of Kang Ha Ri (Song Seung Hong), the leader and an expert con man; Im Byung Min (Lee Si Eon), an expert hacker; Do Jin Woong (Tae Won Suk), a former fighter; and Cha Ah Ryung (Krystal Jung), a street smart pick pocket and driver who was orphaned at a young age. During the course of the drama, they end up getting recruited by Prosecutor Jang In Gyu (Kim Won Hae) to help him gather evidence against particular powerful people whom they can also rip off money from. However, along the way, the team members and Prosecutor Jang end up getting caught up in an even bigger scheme as they slowly discover that they are all connected in some way or another. The drama started out really strong as it thrust us right in the middle of a fun action sequence, and managed to introduce our characters and how much fun they are having right away. However, the usual exposition aside, when it came to its main narrative, it knew the main storyline and plot points that it needed to make, but it lacked a cohesiveness in execution, which was a shame, especially as I do look forward to seeing how a con or heist can be pulled off smoothly, and how fast they can recover when things do inevitably go wrong. There were also some pacing issues and sometimes there were also glaring issues with the script itself. I also felt that the main villain, although he was terrible and despicable, was more detached than his minions that they first went after, which is a shame, because having him be defeated in the end didn’t feel as satisfying as one would want to feel at that particular moment in the story. I did really like the ending, even though it was predictable, as it left me with a smile on my face; and the ending was nowhere as bad as the ending of “Black”. Our main crew in their innovative home made out of recycled container vans. However, I did love the camaraderie and loyalty that this group had with each other, and I was very impressed at how far some characters came along as they worked on cases and got to the heart of things towards the end of the drama. All of the performances were good, as each one of them gave it their all, but among their performances, I really loved the focus that the show gave to Lee Si Eon’s Im Byung Min and I enjoyed watching him act in this series, especially as he was just a supporting character in “Live”. I am always happy to see Kim Won Hae in anything, and I’m so glad that he was a more prominent character this time around. It was really great to see how these actors were naturally able to slip into the skin of these characters, which made every awesome interaction they had with each other seem so natural, which ended up making the drama for me. “Player” has pacing issues that end up failing its strong premise and which makes the execution of planned heists not be as smooth as one would hope it would be, but it is watchable and enjoyable, especially for the little character moments, the camaraderie that this crew has with each other, and all the moments that they have with each other all the way until the end. As mentioned earlier, I had a lot of problems with the pacing of the overall story and with the script at times. Sometimes, they got a little bit too heavy handed and there were moments that I saw as kind of pointless and thought that there could have been a better way to execute some scenes. With regards to the pacing and how incohesive it was, this is something that I saw in the first few episodes. At first it seemed as if this show was going to be more of the case of the week type with an underlying story arc, but later on, it turns out that everything was connected right from the start. I wish that that was introduced right from the start in order to set the tone for the rest of the drama. I also felt that the introduction of the villain, and the point where our entire crew plus the prosecutor were on the same page, was done a little bit too late into the game. I think that this is what made our main villain’s downfall not as satisfying as we would have wanted it to be, and that’s why it felt like the lead up towards the ending was a bit too rushed. I also hoped that the heists or cons themselves went a little bit smoother than how they executed it, especially as they are supposed to be experts in their particular fields. However, I did like the potential the story had, but it didn’t let me down as much as “Black” or the recent “Fantastic Beasts” movie. I am so glad to see Kim Won Hae have a character that’s more prominent in a drama, and I am also very happy to note that his character’s fate isn’t the same as what happened to his character in “While You Were Sleeping”, although for a moment, I thought that they were going to go there. I know that I’m very much comparing this drama to “Switch: Change the World”, as it is very similar and had heists that ran more smoothly, and had a great villain to boot; but what this drama does differently is that it was able to truly focus on the individual team members themselves and gave them such a great bond with each other that they came out of everything as one family. I loved how, in particular, the boys were able to be the older brothers and the family that Ah Ryung never had in her life. Each of our characters went through their own little journeys. Ah Ryung went from having no family to having a protective and loving one, Ha Ri was finally able to let go of his past and gave his father the justice that he deserved, Jin Woong found a great family whom he could fight for and who could also keep him in check if he got too emotional, Prosecutor Jang got to see justice served to the people who deserved it, and Byung Min was able to make up for his past sins as he had been a very willing tool for the villains of the series. All in all, “Player” was a fun breath of fresh air in OCN’s current line up which has been heavy and intense for a while; and was enjoyable and watchable all the way until the end despite its many glaring flaws. Have you seen “Player”? What did you think of it? Let me know what you think in the comments below!